Prepare a charcoal fire and heat the grill over it. 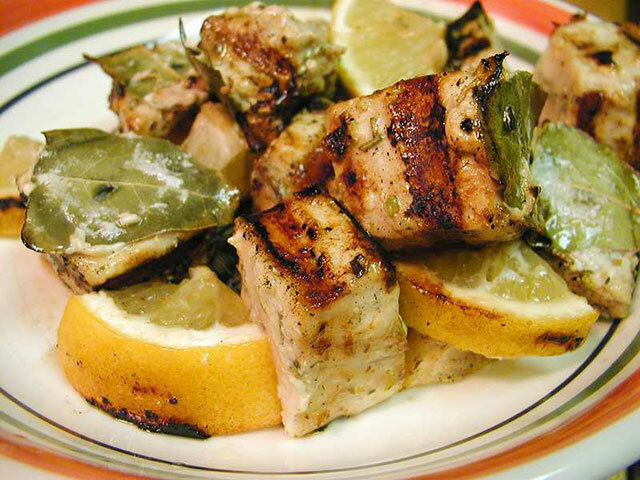 Dry the swordfish steaks with paper towels. Brush them on both sides with extra virgin olive oil, season with salt and pepper, then dredge in the bread crumbs. Place the fish over the medium-hot part of the fire and grill until the bread crumbs turn when golden, no less than 5 minutes per side; if they begin to toast too quickly, move the fish to a cooler part of the grill. The cooked swordfish should be golden brown and the flesh should begin to flake when you press it with your finger. INGREDIENT NOTE: Buy larger-sized swordfish steaks so they can be cut thicker, in other words, instead of asking for four 6-ouncers, ask for two 12-ouncers, and then have your fishmonger slice them into individual portions. The steaks should be about 1 ¾ to 2 inches thick.